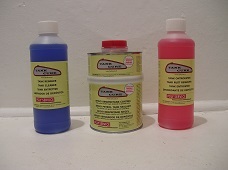 Tank Cure sealant kit comprising of a de greaser to remove residual oil and grease, rust remover to stabilise any rust within the tank. Modern ethanol fuels can cause rusting of the inside of even new fuel tanks. 450 grams of two part epoxy tank sealant which should be enough to seal a fuel tank of up to 3-4 gallons, larger kits are also available.